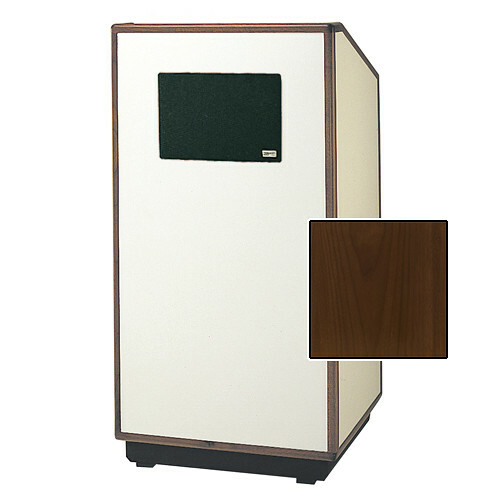 The standard honey maple veneer Cambridge 42" Special Needs Floor Lectern from Da-Lite comes with electric height adjustment and a sound system from AmpliVox Sound Systems. The sound system provides up to 120W of RMS output. The lectern features an oversized reading surface that holds a 3-ring binder. It also comes with heavy-duty industrial casters for easy mobility. This lectern incorporates an LED digital clock / timer with countdown capability, which lets presenters pace themselves throughout their presentations. This floor lectern features a handsome wood trim that defines its edges for a soft, contemporary look. Additionally, it comes equipped with height adjustment and Braille identification, so that the unit provides ADA accessibility. Note: Power interruptions will cause the clock to flash until reset. Power supply and amplifier can be accessed internally. Controls can be accessed by removing the dash panel. Inserting a plug into external speaker jacks will disconnect internal speaker. Low impedance (<2Ω) will cause excessive heating, thereby reducing amplifier output. Box Dimensions (LxWxH) 48.0 x 47.0 x 36.0"